6 Novelists Withdraw From Event Honoring 'Charlie Hebdo' For Free Speech : The Two-Way Peter Carey and Rachel Kushner are among those who are withdrawing in protest from the PEN American Center's annual gala. Kushner says she is uncomfortable with Charlie Hebdo's "cultural intolerance." 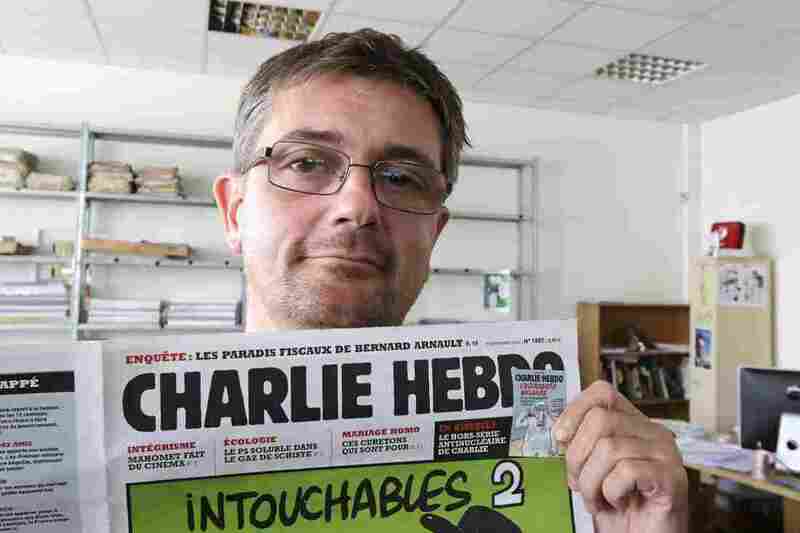 Stephane "Charb" Charbonnier, the late editor of Charlie Hebdo, is seen in September 2012. PEN American Center's decision to give the French satirical magazine its annual Freedom of Expression Courage Award has prompted six writers to withdraw from the annual event. Six writers have withdrawn from the PEN American Center's annual gala on May 5 in protest against the free-speech organization's decision to give the French satirical magazine Charlie Hebdo its annual Freedom of Expression Courage Award. The writers who have withdrawn from the event are Peter Carey, Michael Ondaatje, Francine Prose, Teju Cole, Rachel Kushner and Taiye Selasi, The New York Times reports. "The day after the attack, the surviving staff of Charlie Hebdo magazine vowed to continue publication, releasing their next edition on time with a print run expanded from 40,000 to over eight million under the mantra 'All is Forgiven,' donating all proceeds to the families of the victims. The Charlie Hebdo attacks dealt a blow to the bedrock principle that no act of expression, no matter how provocative or offensive, can justify violence." Charlie Hebdo had long pilloried political and religious figures, but it was the publication's depiction of Islam's Prophet Muhammad that had drawn intense scrutiny — as well as death threats from militant groups. Many Muslims consider any depiction of their prophet — even positive ones — to be offensive. Critics of the magazine say Charlie Hebdo was being deliberately provocative. Kushner, in an email to the Times, said she was withdrawing from the May 5 PEN gala because she was uncomfortable with Charlie Hebdo's "cultural intolerance" and promotion of "a kind of forced secular view." Those views, the Times added, were echoed by the other writers who pulled out of the event. Carey told the Times that PEN, in its decision, was going beyond its role of protecting freedom of expression. "A hideous crime was committed, but was it a freedom-of-speech issue for PEN America to be self-righteous about?" he said in an email to the newspaper. Novelist Salman Rushdie, a past president of PEN who spent years in hiding because of a fatwa over his novel The Satanic Verses, criticized the writers for pulling out, saying while Carey and Ondaatje were old friends of his, they are "horribly wrong." In a statement Sunday, PEN said: "We do not believe that any of us must endorse the content of Charlie Hebdo's cartoons in order to affirm the importance of the medium of satire, or to applaud the staff's bravery in holding fast to those values in the face of life and death threats." "We recognize that these issues are complex, and that there are good faith differences of opinion within our community. ‎At PEN, we never shy away from controversy nor demand uniformity of opinion across our ranks. We will be sorry not to see those who have opted out of the gala, but we respect them for their convictions." The award for Charlie Hebdo will be accepted by the publication's film critic and essayist Jean-Baptiste Thoret, who had arrived to work late on the day of the attack.